A long-time favourite, Pokka Jasmine Green Tea is now available in a calmingly aromatic No Sugar option that is authentically-brewed to perfection with premium green tea leaves, giving you a smooth, light and soothing refreshment, minus the calories. Enjoy this perfect companion in your quest for inner peace and a rejuvenating serenity. Ready to drink tea. Consume promptly upon opening. Ingredients: Water, Freshly Brewed Jasmine Green Tea, Ascorbic Acid, Flavourings. 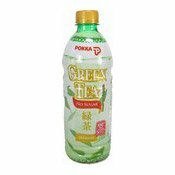 Simply enter your details below and we will send you an e-mail when “Jasmine Green Tea Drink (No Sugar) (無糖綠茶)” is back in stock!